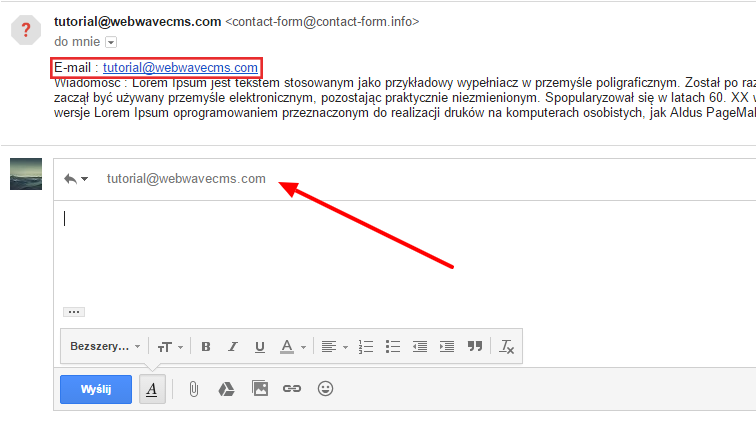 In website builder WebWave element "Form" allows you to make contact with users by asking them to answer your question or to tick some boxes and send answers to certain e-mail. In this article, you will learn how to build a website with a from. In website builder WebWave you can add form from the toolbar on the left side of the builder. All you have to do is drag form icon and drop it on the website. A new form has two default fields. First one is for e-mail, second for a message. Button "Send" sents message to entered e-mail. After clicking on a form you will be able to edit its style in the Settings panel. Normal - button style before a user sends a form. Hover - button style when a user hovers over it. 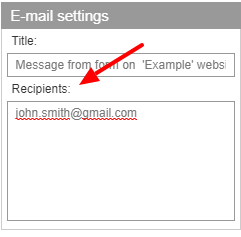 After sent - button style when a user sends a form. On error - button style when a user sends a form, but an error occurs for example when a user didn't fill one of the form fields. Set spaces between form rows in pixels. 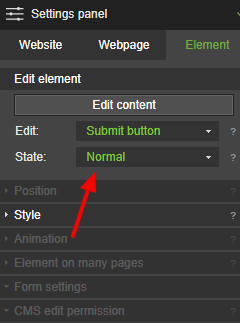 In order to edit form, click on it and select "Edit content" in side edition panel. To add form element, in a new window select "Add form element" and type label name, tick a box if the field is compulsary and choose its type. In order to remove form element, unroll its details and select "remove form element" or just drag and drop it outside of the window. To change the order of form elements, click on the selected field and move it to the chosen place in your form. Placeholder - text displayed when field is not filled out. Entering even one character removes a placeholder. Required - should this field be compulsory. Label and placeholder can be also edited by double clicking on it and entering text. To edit form click on it and select in the Setting panel "Edit content". Title of an e-mail sent from a form can be set in "E-mail settings" on the right side of Form edition window. Form recipients are people, who will get an e-mail when somebody fills out the form and sends it. You can set more than one recipients, entering each one in a new line on the right side of Form edition window. To set a label style double click on it. From now on every change made in the Settings panel and text editor will apply to every label. To set inputs style double click on any input field. 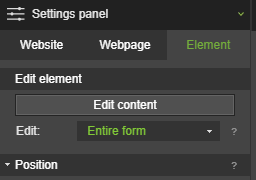 From now on all changes made in the Settings panel and text editor will apply to every input field. In order to set the submission button style, double click on it. In the Settings change its color, borders and more. To enter text which will be displayed after the user sends a form, change in the Settings panel state of submission button from "Normal" to "After sent". Double click on the form and from now on, every changes you make in terms of text content or button style will only apply in "After sent" button state. You can change button state "On error" style exactly the same way. 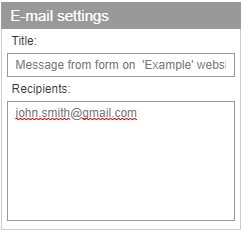 If your form has a field where users input their e-mail, then when you answer a message from the form, the recipient will be automatically set as e-mail address entered by the user. Placeholder is a text displayed in form input fields when a user hasn't filled them out yet. Typing even one character makes placeholder disappear, but deleting it makes it visible again.